EasyCart user accounts keep track of all the important customer information during orders. All EasyCart accounts are 100% separate from WordPress user accounts as we track much more data and are able to use the accounts in many different ways. Users may create accounts on your website via the account page, or via checkout during an order. You may also create a user account by navigating to the ‘User Accounts’ page and adding a new user. Export Users to CSV: You may bulk export user accounts to a CSV file for handling in other mail programs or software of your choice. Either export all to CSV or you may filter and select specific users to export to CSV. Force Resetting Passwords: You may reset users passwords when you select specific users and choose to force reset user passwords. Simply add the necessary information such as the users first and last name, email address, and password. You can designate this account as the default ‘Shopper’ access level, or if you have custom user roles setup, you can choose to designate it as such. Note: Any account designated as ‘Administrator’ can login to your easycart system using our external phone or tablet apps. Normal users of your site such as customers or wholesalers should not be designated as ‘administrator’ accounts. Optional settings let you add personal notes to an account, a VAT registration number in some countries as well as other settings. You can designate this user is a subscriber and information will be added to the subscriber section upon creation. 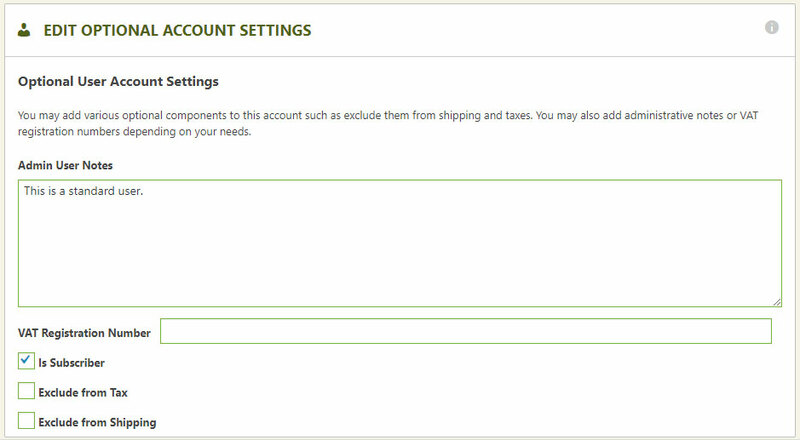 Some user accounts it is nice to exclude the user from Tax or Shipping. If you need to do this per user account, simply select to exclude them in this area. Most online eCommerce businesses sell retail products and ship, so you may edit the customers address information below. Sometimes businesses sell downloadable goods, services, donations, or other intangible products, so shipping addresses are not always required when the user checks out or needs collection. You may edit these addresses in this location. Note: It is important if you choose to enter country and states that you use the valid 2 digit ISO codes. We leave them open ended, but if you live in a country that may use shipping API systems, it is a good idea to stay consistent on the data.